Sometimes it’s accidental but more often than not it’s intentional. Disinformation is all a part of COINTELPRO (Counter-intelligence Programs) and Psy-Ops (Psychological Operations) and has been carried out by individuals, corporations and yes, even government agencies. It is important to remain vigilant when viewing anything related to 9/11 as this type of Tom-foolery runs rampant online. Especially amongst social media sites where people are often too busy Liking, Sharing or Retweeting to actually do any investigation into what it is they’ve actually just seen. Take this for example. Watch the below clip. 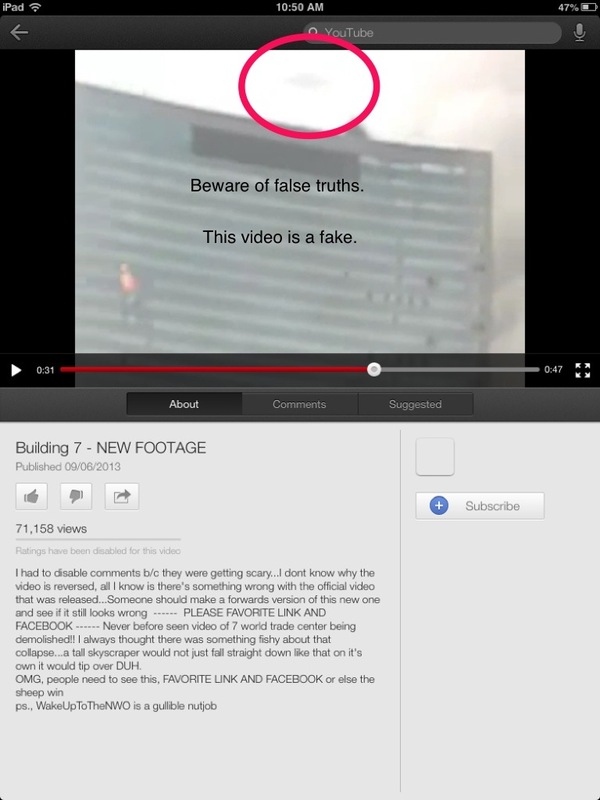 The video is drawing your attention to the flashes going up the side of the building and windows breaking as if to illustrate a controlled demolition of WTC7 on 9/11. So what you might say? Well I didn’t realise extraterrestrials were responsible for that towers demise. Did you? Have a look at the image below where I’ve circled the UFO before it flies away. I will admit, I didn’t see it the first time I watched it though I didn’t immediately believe what I was seeing. So I asked for the opinion of someone who has done years of study on 9/11, Dr Judy Wood. My point is, don’t believe everything you see. Question it and do your own research before coming to a conclusion. Take emotion out of the equation as sometimes you won’t like the conclusion the evidence brings you to. But you will be left with truth. Please watch this lecture by Dr Judy Wood. Did you actually ask her? Like, did you call her up and talk to her and ask for her opinion? Or did you link a YouTube video you found in support of your statement that you asked her? Given you are quite the super sleuth, I believe you will realise which assertion will have the greater creedence. I certainly did. We Skype now and again.